Canadian rockers THEORY OF A DEADMAN roll through Wisconsin in support of their special edition release of “Scars and Souvenirs.” After lots of success in the states both touring and through various compilation albums the band has developed as musicians, and find themselves “growing on all sides,” according to Tyler Connolly (vocals and guitars). Several video game appearances, work with the WWE, and showcases in movies, such as Transformers: Revenge of the Fallen, has launched THEORY OF A DEADMAN to chart topping success. Their most recent album has presented a more mature writing style. Connolly explains, “it is now a more thought out process… before it was just whatever came out first.” The evidence is apparent as Connolly’s lyrics delve into broader terrain, and it exposes the musical talents of THEORY OF A DEADMAN. They effectively step away from angrier content and create songs that are very dark as well as songs that are just for fun. As the band matures they are devoted to “maturing without getting grey,” and they have learned the value of a great album with lots of promotion. “Simplicity is what we do,” explains Connolly, “we simply want to make playing (for us) and listening (for the crowd) a good night out.” They plan to break the cycle of their 3 years, one album trend, and hope to put out a new record within the next year. The economy over the last year has been difficult for everybody and it is especially apparent in the music industry. As formats change and record companies work on new ways to make money from music there develops a question about where chart climbing artists are headed. “Playing for a living is a dream come true,” Connolly gushes, “and we have to do whatever the trend is to keep in the game. We hope everything will settle back in the next couple years, and the CD will be non-existent in the near future, and we plan to change with the times.” Their attitude and dedication to the music seems to be their key to success. 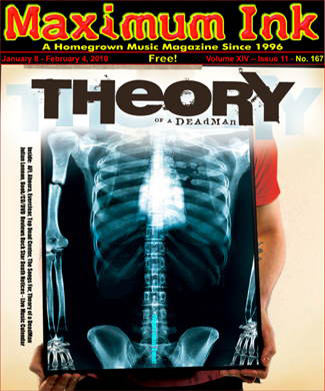 As a self declared “straight up rock and roll band,” THEORY OF A DEADMAN plans to continue their attempts at “reaching people all over the world.” They will be reaching out to our neck of the woods in Milwaukee on January 24 at the Rave. They look to go on spreading their influence of classic rock meets modern age and continue to keep audiences singing along with their music.